How Long Does Sunblock Last on Your Skin? We here at Sundicators have been waving the flag for sunscreen and sunscreen re-application from the very first post this blog has presented. We’ve also touted our amazing Sundicators UV monitoring wristbands that alert its wearers, by way of simple color-changing technology, when to re-apply. But let’s for the moment assume that you don’t have any Sundicators and you’re asking yourself the question, how long does sunblock last on your skin? The amount of time that sunscreen lasts on any given individual is not really fixed. There are actually several factors that contribute to the weakening of its effectiveness on people. Swimming, jogging, or any other activity that causes a person to sweat will reduce the amount of time that sunblock will maintain its protective abilities. And if you are in fact a swimmer, you should certainly re-apply sunscreen just as soon as you emerge from the pool, lake or ocean. Generally speaking though, if you have no way of monitoring the reduction of your sunblock’s efficiency, the rule is to re-apply it every two hours that you spend outdoors. But again, if you’re active in any kind of athletics, or are involved in any significant movement, it’s better to do it even more often than that. Because significant amounts of movement will hasten the erosion of the sunscreen’s effectiveness on your skin. We’d go into more detail as to why, but we trust you to understand why that should be kind of self-evident. One of the hardships that all sun-safety proponents face, is to try and drill into people that their initial application of sunscreen is simply not enough. Unfortunately, many of those who remember to apply it before they go out for the day believe that that one coating is sufficient. The truth though is that it isn’t. In fact, people who apply a single use of sunblock and then spend several hours, or even all day, outside, may like as not hadn’t even have bothered to have used it at all. We here at Sundicators have a tendency to occasionally use old sayings to assist us in getting our various points across. And to maintain our consistency, we’ll add one here; better safe than sorry. Any prolonged exposure to the sun can, and almost always does, result in one or more forms of the sun skin damage that’s caused by that star’s harmful UV rays. Sometimes, the result is the premature aging of your skin. Other times, it’s wrinkles and sun spots. Beyond that, it can cause basic skin cancer or, even much worse, Melanoma. Nobody, and we mean nobody, wants a diagnosis of Melanoma. In fact, when you have a free minute go right ahead and run a search on it. And then you’ll see exactly what we mean. So when you’re outdoors, let caution be your guide. Even if it hasn’t yet been two hours since your first sunscreen application, the very minute you sense that more is needed, add it. You have absolutely nothing to lose, and everything to gain. Wash-On Sunscreen: Sun Protection Alternative? Does Aloe Vera Help with Sunburn? Very informative article and was getting ready to share it on Facebook when I noticed the word “sunblock” in the title. As a certified Melanoma Educator with the Melanoma Research Foundation, I have been taught there is no such thing as sunblock or waterproof when it comes to sunscreen and that any sunscreens that include these words are guilty of false advertising. Please set me straight if this is not correct. Thanks! We use both names in our article (which is not on label advertising) because many people use both sunscreen and sunblock as describing words. 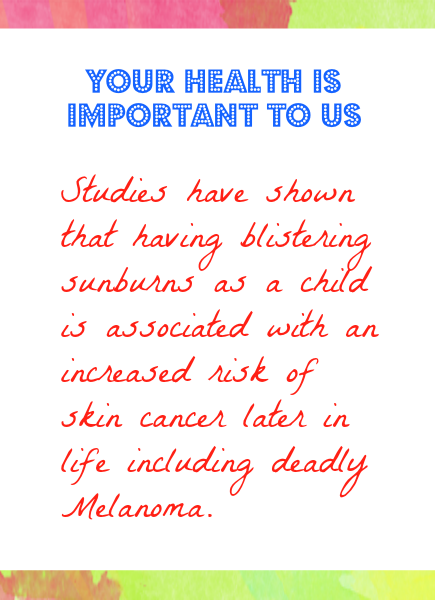 We are simply trying to express the importance of wearing sunscreen. We also try to change keyword variations to help spread the importance. As a Melanoma Survivor and someone who has supported the Melanoma Research Foundation for years – – and several lunches with Tim Turnham, our goal would never be to confuse but we like to use broad terminology to appeal to every-body. Not everyone has your education on the subject. Together we are working toward to same goal.